1 STARTER Was passt nicht? 2 WALT recognise the patterns involved when working with different genders. 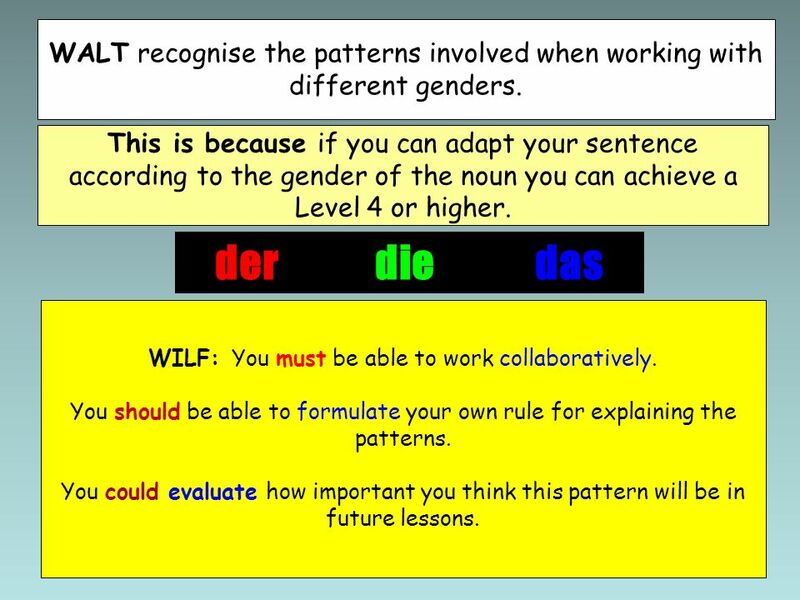 This is because if you can adapt your sentence according to the gender of the noun you can achieve a Level 4 or higher. der	die	das WILF: You must be able to work collaboratively. You should be able to formulate your own rule for explaining the patterns. You could evaluate how important you think this pattern will be in future lessons. 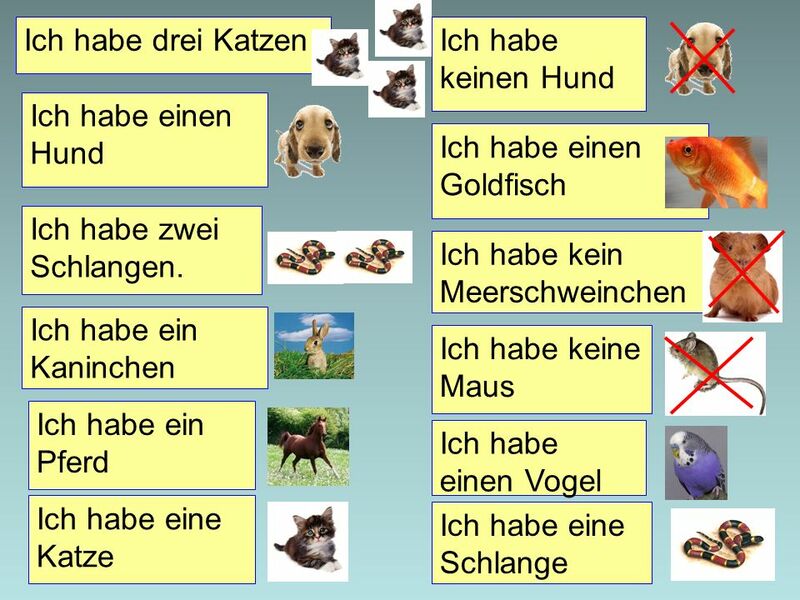 Share with class, then ask for explanation of gender – need to know, not just for pets, everyday things in German! 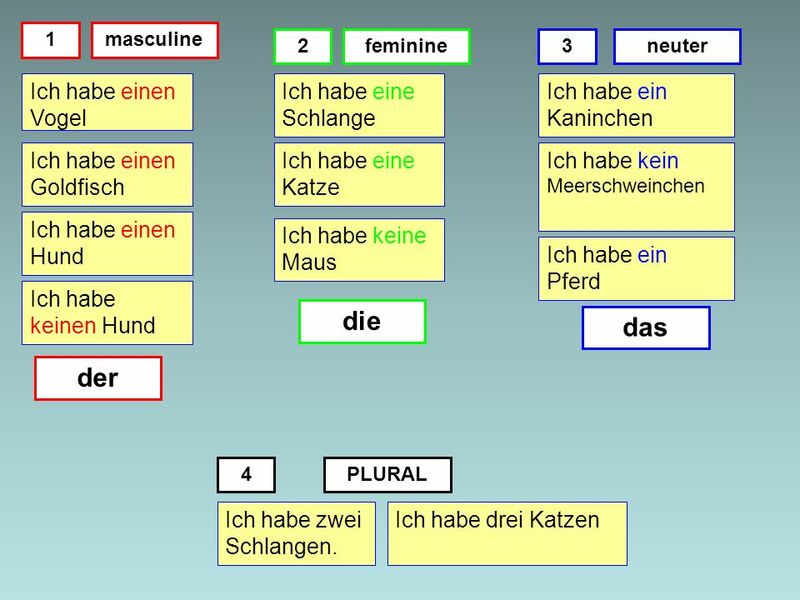 Elicit der, die and das from class. Then, hand out envelopes with pet phrases and match them to the correct picture. Show next slide so they can check it’s right. 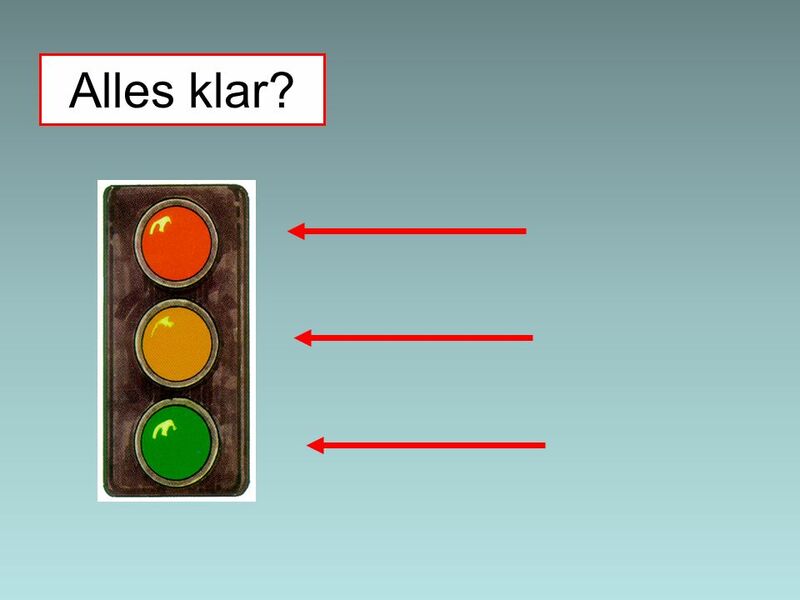 5 Alles klar? Mini-plenary, check understanding offer support to those who are not clear. 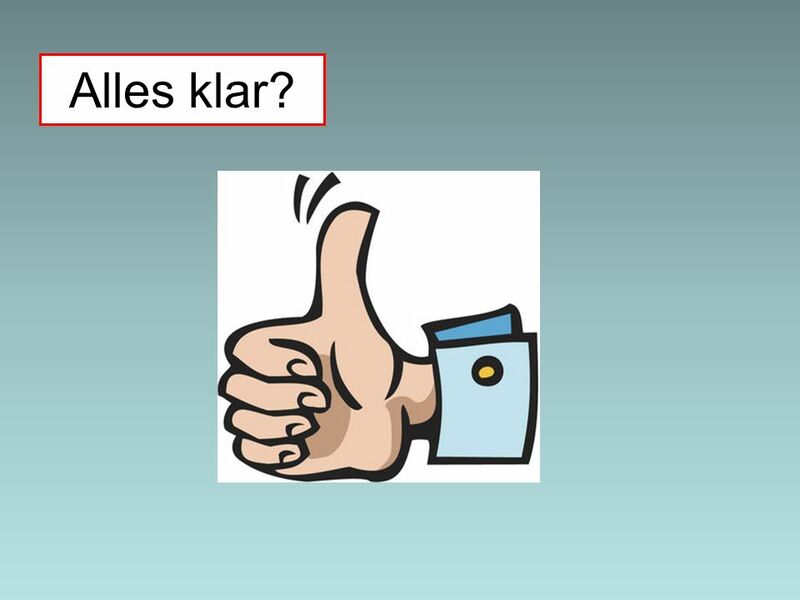 7 Alles klar? Mini-plenary, check understanding offer support to those who are not clear. 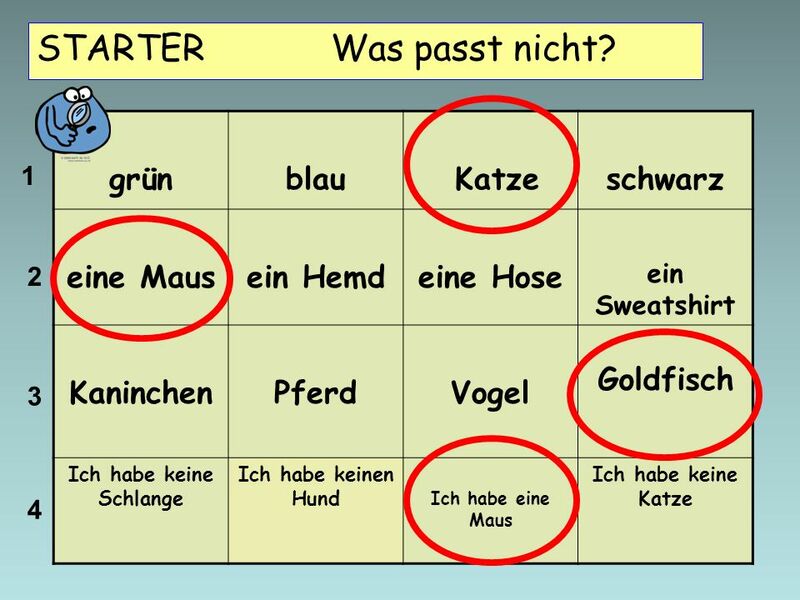 9 Die Katze Ich habe eine Katze Richtig! 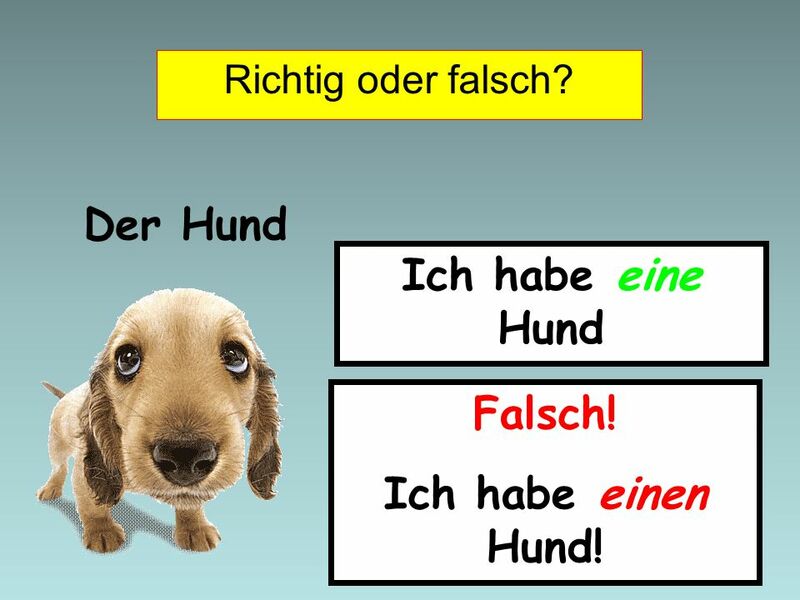 10 Der Hund Ich habe eine Hund Falsch! 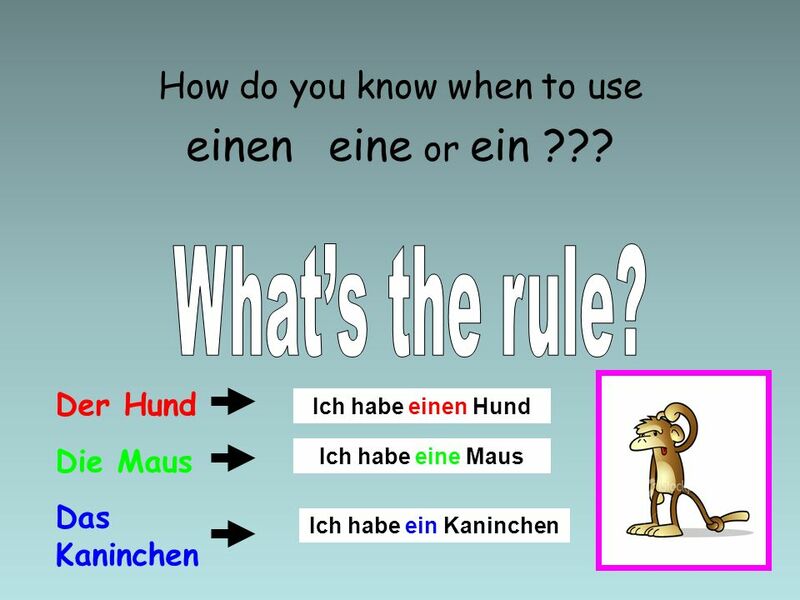 Ich habe einen Hund! 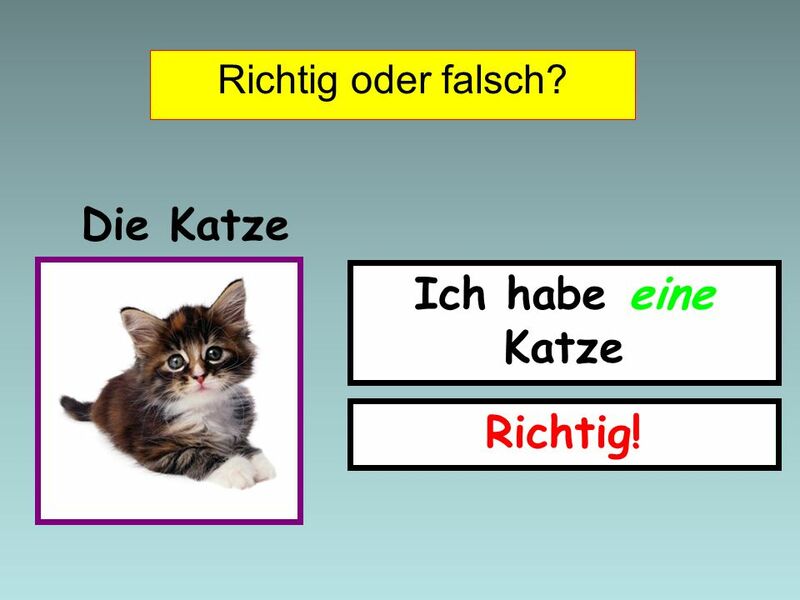 Richtig oder falsch? Der Hund Ich habe eine Hund Falsch! Ich habe einen Hund! Richtig oder falsch? 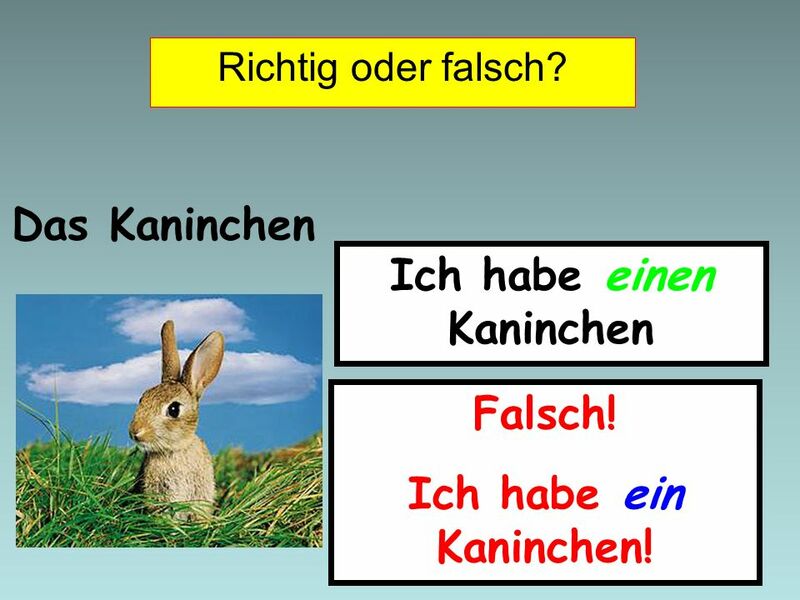 Das Kaninchen Ich habe einen Kaninchen Falsch! Ich habe ein Kaninchen! 12 WALT recognise the patterns involved when working with different genders. Use mini white boards to get all class involved in the plenary and thinking. 14 Plenary: Blau! Thinking- What have you learned? Click to spin! What did you do next? 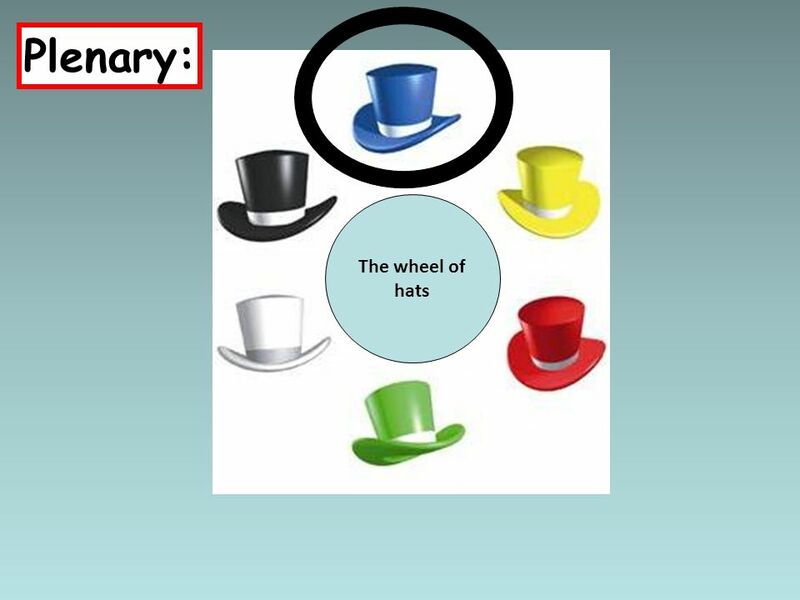 Plenary: Click to spin! What did you do first of all today? What did you learn? Thinking hats just click and go. Proud of this!!! Blau! Thinking- What have you learned? 15 Why? Plenary: How did you feel about what you have been practising? Do you think being able to use different words for ‘a’ is important? 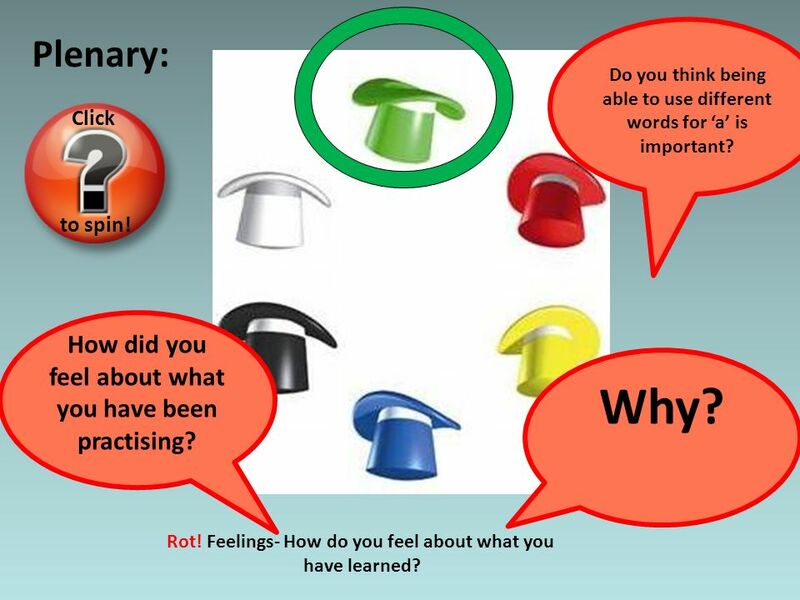 Plenary: Click to spin! How did you feel about what you have been practising? Why? Thinking hats Rot! Feelings- How do you feel about what you have learned? 16 Plenary: Are there any disadvantages to the way we have learned today? Click to spin! What would be a better way to learn how to say what pet you have? 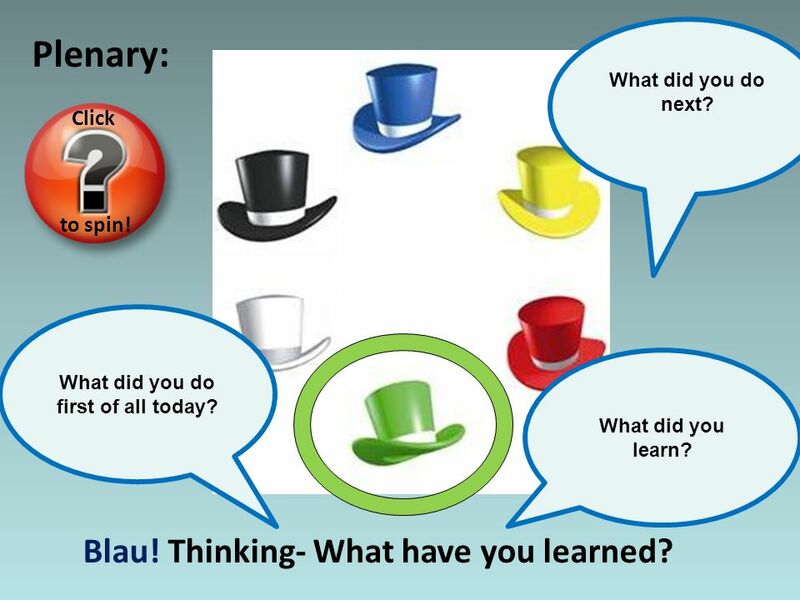 Thinking hats Schwarz! 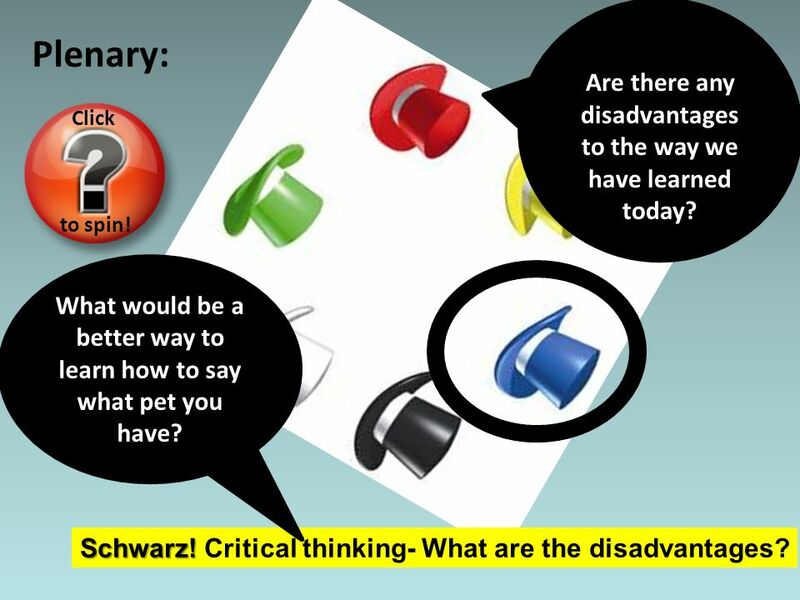 Critical thinking- What are the disadvantages? Herunterladen ppt "STARTER Was passt nicht?"